*AdvaCare Tylvalosin Tartrate Soluble Granules are GMP certified. **AdvaCare Tylvalosin Tartrate Soluble Granules are manufactured in our facilities located in China, India and USA. AdvaCare is a GMP manufacturer of Tylvalosin Tartrate soluble granules. Tylvalosin is a semi-synthetic macrolide antibiotic that inhibits the formation of bacterial protein its reproduction. It is used to treat respiratory infections such as; swine pasteurellosis, porcine infectious pleuropneumonia, mycoplasmalpneumonia of swine etc. and alimentary infections like; porcine proliferative enteropathy, swine dysentery, and sow postnatal infections; metritis, mammitis, agalactosis, etc. 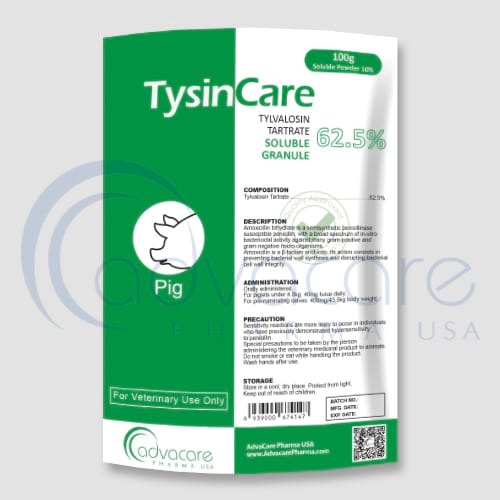 Always consult a veterinary physician or animal care specialist before using tylvalosin tartrate soluble granules. It is indicated in the treatment and control of porcine proliferative enteropathy (PPE) associated with Lawsonia intracellularis infection. It is also indicated in the treatment and control of swine respiratory disease (SRD) associated with Bordetella bronchiseptic, Haemophilus parasuis, Pasteurella multocida, and Streptococcus suis. It is only used in the drinking water for pigs. Mixing with the feed is not recommended. Preparation of drinking water medicated with 50 parts per million tylvalosin, where dosage in 40g sachet is 25mg per 132 gallon of water in 1 gallon of stock solution, in 160g sachet is 100mg per 528 gallon of water in 4 gallon of stock solution and in 400g sachet is 250mg per 1320 gallon of water in 10 gallon of stock solution. The safety and efficacy of this formulation in species other than swine have not been determined. If the condition does not improve or becomes worse, then call a veterinary physician or animal care specialist. Tylvalosin tartrate soluble granules are not meant for human consumption, however in the case of accidental ingestion, one should seek medical advice. Avoid direct contact with the eyes and skin. One must wear coveralls, a mask, suitable gloves and eye protection when handling the product. 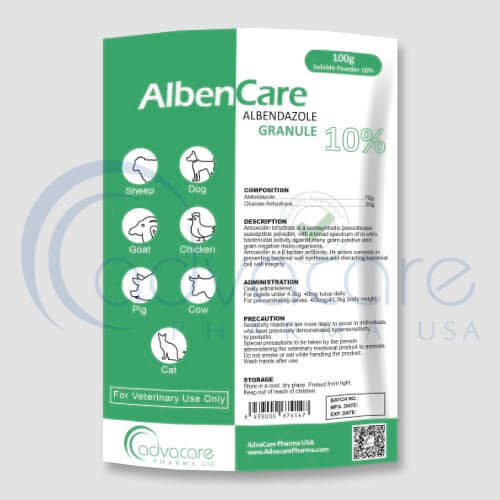 Consult with an animal care specialist about any other medications that are being taken by the animal, and their medical history, before their treatment with tylvalosin tartrate soluble granules.